Couchsurfing – Raconte Moi Ca ! You’re so many to request my couch every week. However, I can’t host everybody in my little parisian flat even if you all seem to me very sympathic ! 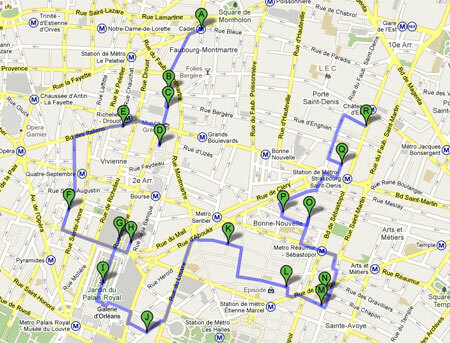 So, I decided to give you some good directions & addresses to have a nice trip in Paris. A. Climb on the Triumph Arc to see the beautiful perspective of the Avenue. B. Stop at « Ladurée » to eat some macarons (french cakes). Don’t hesitate to enter on the stores, there are a lot of special exhibitions everyday. C. Reserve your ticket to see special exhibition at « Le Grand Palais » and observe its wonderful roof made of glass and steel. D. Visit the « Invalides » where Napoleon is buried. E. Look at the front of the National Assemblee. F. You’re now at the end of the Avenue. Look at the perspective and the impressive obelisk. G. Cross the garden, order an icecream, take a seat … chill out ! 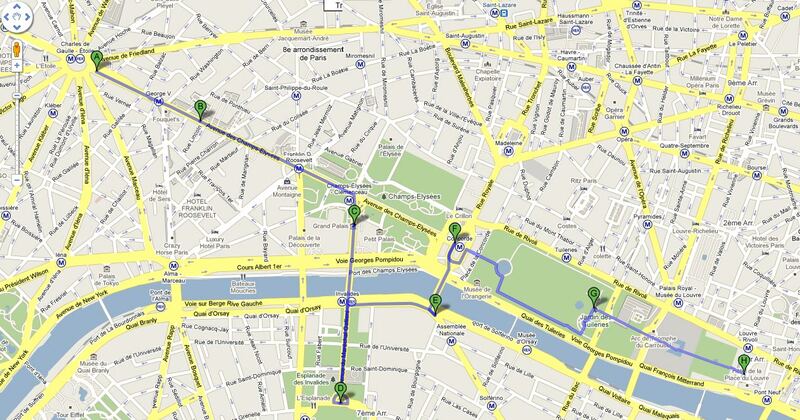 Take the Subway to « Trocadero » (line 9) to see the Eiffel Tower. F. Enter the cathedral of Notre Dame. You can climb the stairs of the towers. 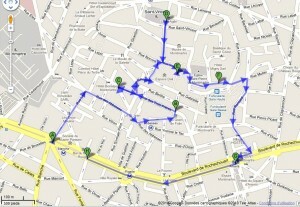 G. Get lost in the little streets of « Saint Michel » with a lot of touristic restaurants. Stop at the fountain. I. Pantheon – an historical monument where famous people (Victor Hugo, Gambetta, etc.) are buried. J. Order the best icecream of Paris (Berthillion). 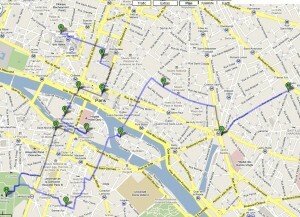 M. Finish your walk in bars & restaurants of the quarter. 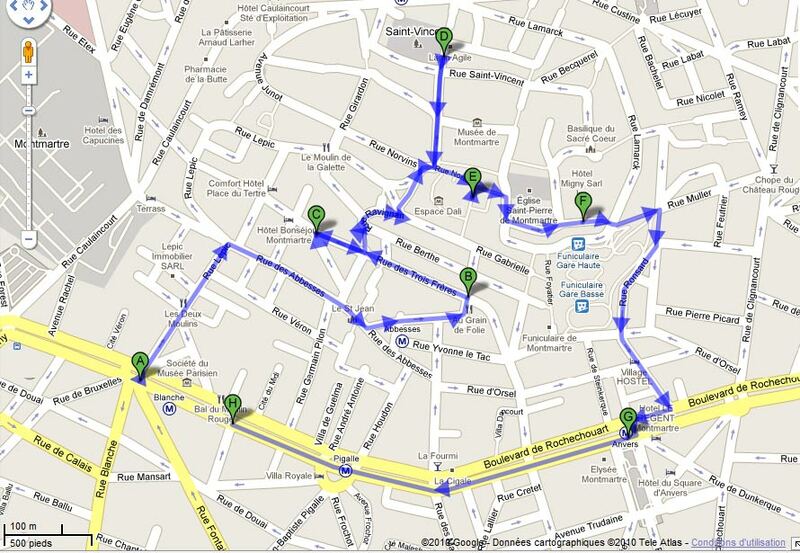 Itinerary 3 – Montmartre & Pigalle / 2h. C. Stop in front of the little house « Le Bateau Lavoir » where Modigliani, Picasso, Gauguin, Brancusi… lived. Itinerary n°4 – My favorite one ! 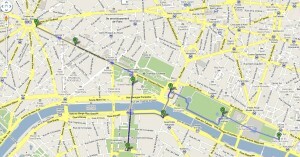 « Covered passages » of Paris are commercial alleyways between building that host numerous shops. Mostly built during the 19th century they protected from the rain the well-off customers. Now they shelter restaurants, bars, second-hand bookstores, art & photo galleries. 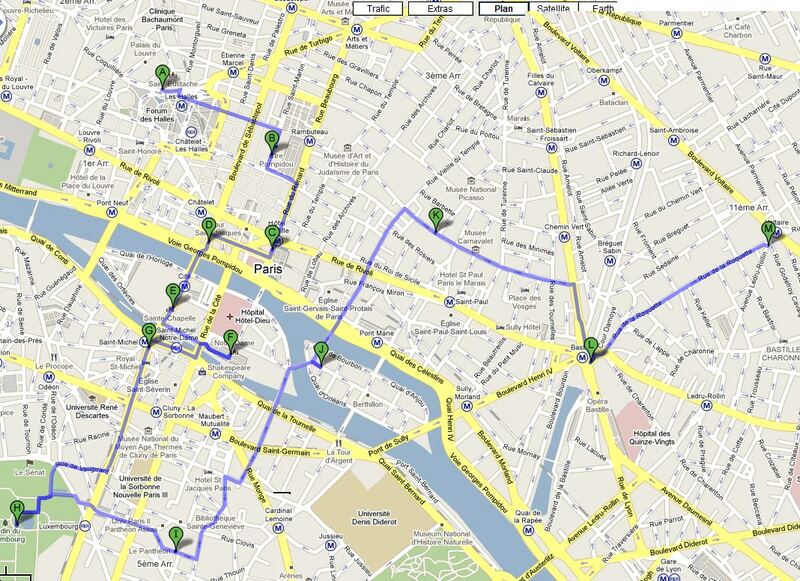 You’ll discover Paris through a different and eccentric eye ! This itinerary is definitely my favorite one ! – L’international : Folk & Pop music everyday. A very busy place but so cool to meet french young people ! – UFO : You like beer and alternative rock music ? This place is for you ! – L’Orange Mécanique : Alternative rock music bar. – Culture Rapide : Bohemian ambiance & Open Mic everyday. Tell a poem on the stage and win free drinks ! – Le Tagada Bar : traditionnal french bar. You can also eat french specialities. – Le Rendez-vous des Amis : Busy bar with a lot of french people. – La Mécanique Ondulatoire : the best place to drink a beer and listen to alternative music. Going Underground ! – James Hetfeeld’s Pub : Rock / Dubstep ambiance. A good place to meet people / foreigners. – Mauri7 : a busy bar to end your night of trouble ! The street is full of people and cheap bars that close at 2am. – Prohibido : Small and busy cuban bar.